Proceedings of the Floridians in deliberating on important affairs. 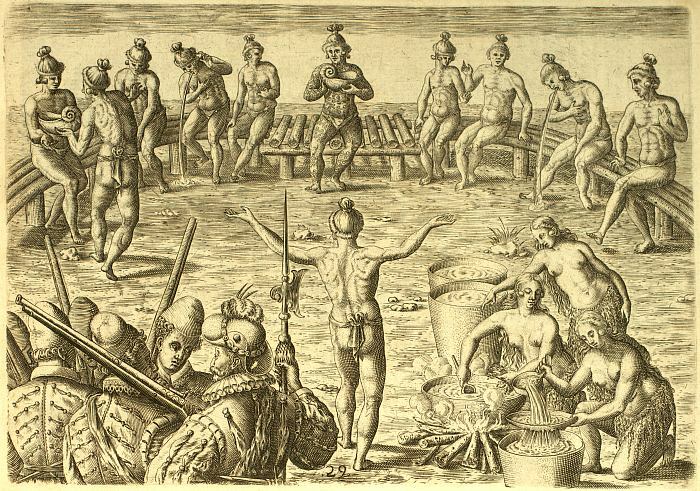 The chief and his nobles are accustomed during certain days of the year to meet early every morning for this express purpose in a public place, in which a long bench is constructed, having at the middle of it a projecting part laid with nine round trunks of trees, for the chiefs seat. On this he sits by himself, for distinction’s sake ; and here the rest come to salute him, one at a time, the oldest first, by lifting both hands twice to the height of the head, and saying, ” Ha, he, ya, ha, ha.” To this the rest answer, “Ha, ha.” Each, as he completes his salutation, takes his seat on the bench. If any question of importance is to be discussed, the chief calls upon his laUas (that is, his priests) and upon the elders, one at a time, to deliver their opinions. They decide upon nothing until they have held a number of councils over it, and they deliberate very sagely before deciding.